Mrs. Weishaar’s second grade class is leading our efforts to recycle plastic bags and wrapping at C.P. Smith Elementary School. These hard-to-recycle items often end up as litter in our neighborhood or floating in local waterways posing a threat to marine life. Help us dispose of detrimental plastics properly by placing your refuse plastic bags and wrap in the receptacles here at C.P. Smith. The teachers use these efforts as the basis for Science and Mathematics lessons. 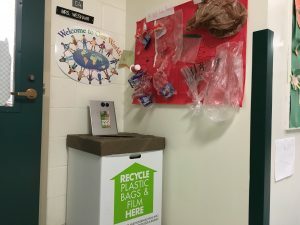 This effort was kicked off at a recent Friday Community Meeting and to date they have recycled 60 pounds of plastic, let’s help them recycle a bunch more!